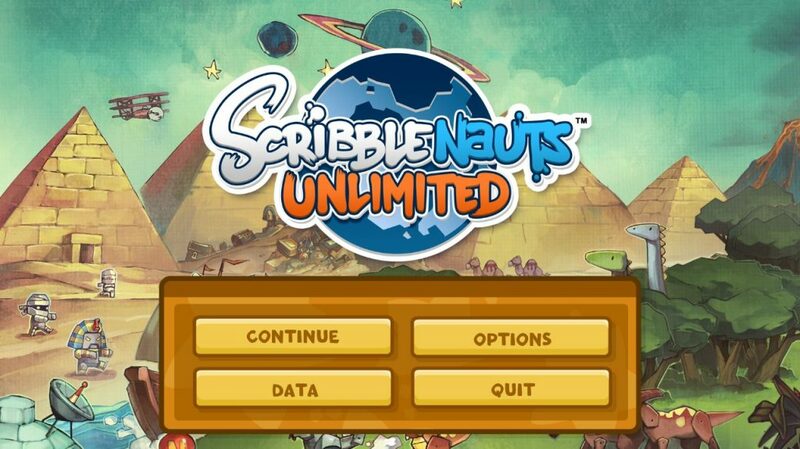 A sequel to the original Scribblenauts franchise for the Nintendo DS, Scribblenauts Unlimited will take you on a new adventure around the world. Travel from the big city, over mythical lands, and into space as you solve unique puzzles using your world navigator and magical notepad. The award-winning franchise is now available on PC with improved HD graphics. You play as Maxwell, a boy wearing a rooster helmet who is granted the power to create objects out of thin air. It’s the first time you are introduced to his extended family and learn how he got his magic notebook. He is sent on a mission to help solve the problems of people, animals, or strange monsters, out of goodwill. And that’s where you come in. Explore the open world and summon objects by unleashing your imagination. There are many features that I’ll be explaining later. The game is about 15-25 hours long on average. Maxwell carried Lily to the farm, hoping to ask his oldest brother Edwin for help. It turns out, in order to remove the curse, Maxwell must collect Starites, which are stars born from random acts of kindness. Hopefully, he can save Lily before it’s too late. 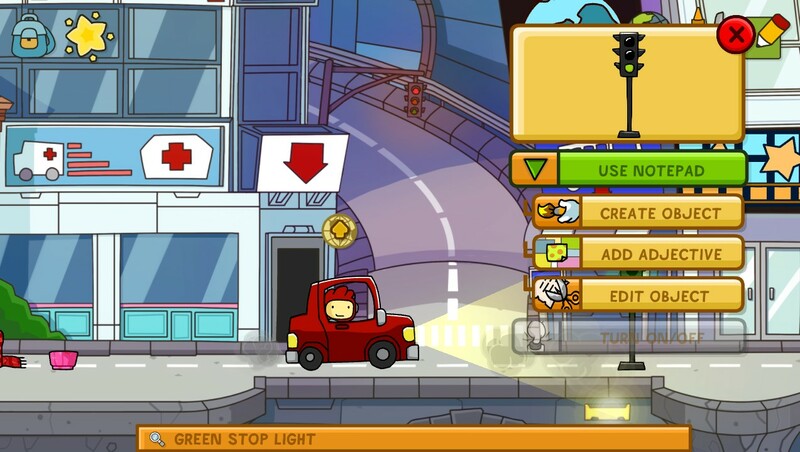 Scribblenauts can be mostly described as a point & type game, with the occasional clicking on objects of interest and drag items you’ve created onto the screen. The controls are fairly simple: Use the arrow keys to move Maxwell. Press the spacebar to jump over obstacles and use the mouse scroller to zoom in or out of the screen. Hold & drag right-click to see more of the area. Maxwell is rewarded a Starite for saving Christmas. On Edwin’s farm is where you’ll be given your first goal to fulfill. Note how there is a Starite above him. This indicates you can click on Edwin to start a minigame which nets you a Starite once you get through all the stages. Your first task is to create a flying pig that will win first prize at the talent competition. To do this, you must first click on the notepad to write an object. If you make any tools, you can use them directly on other NPCs, props and sometimes yourself. It’s also fun to add adjectives to customize people or animals to your liking. When you are stuck on a stage of the minigame, you will receive some helpful hints. 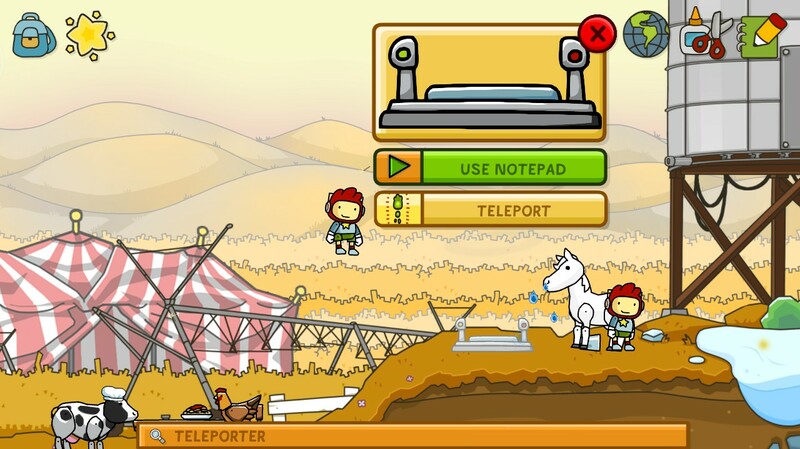 Scribblenauts Unlimited has an easy-to-use interface by clicking on elements of the game prompts you to what you can do with them. The same goes for the rows of buttons as their properties are clearly labeled; when you select something, under Use Notepad are a few options: Create Object, Add Adjective, and Edit Object. “Create Object” takes you straight to the notepad. “Add Adjective” allows you to describe an element by stacking on adjectives like “friendly”, “hungry”, or “green”. “Edit Object” sends you to the object editor which has many complicated features. Other ones exist as well: You could “Pick Up” small items. But there are other “action” buttons too. You can climb palm trees, steal someone’s sandwich, ride on a dragon, attack with your blade, pet a platypus, give your cousin a slingshot, remove objects held by NPCs, use a first-aid kit to heal, empty a treasure chest, and interact with a catapult. The possibilities are practically infinite! If the word exists in the Scribblenauts dictionary, you are free to summon it whenever you want! Although the game tries to be realistic about how objects function, they also add in fictional elements like undead zombies. There are four top icons that are crucial to earning Starites: The Backpack, Magic Notepad, Object Editor, World Map, Starite, and Maxwell avatar will be discussed in depth. The magic notepad is the most essential to Maxwell’s adventure. It operates like a search engine, capable of filtering words from a dictionary that match your query. Type in any set of words and summon an object into the overworld. Non-English speakers should try the accent keyboard. The recycle button lets you return to a previous word. But if you need word suggestions then the speech bubble has you covered. When inventing words to solve the game’s puzzles, I strongly recommend that you keep words short and straight to the point. 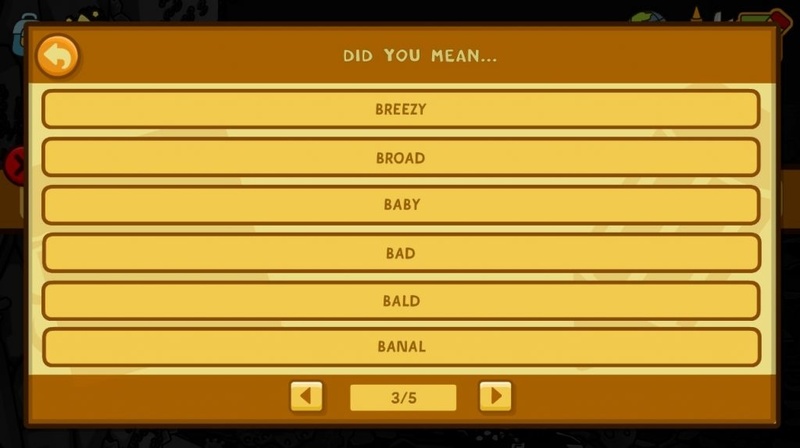 The downside of Scribblenauts is that the dictionary doesn’t recognize word combinations such as “Bacon and Eggs”. You have to type them separately. Another issue I run into is that you can’t type more than one noun for every summon. Realistically, the backpack should be overflowing by now. 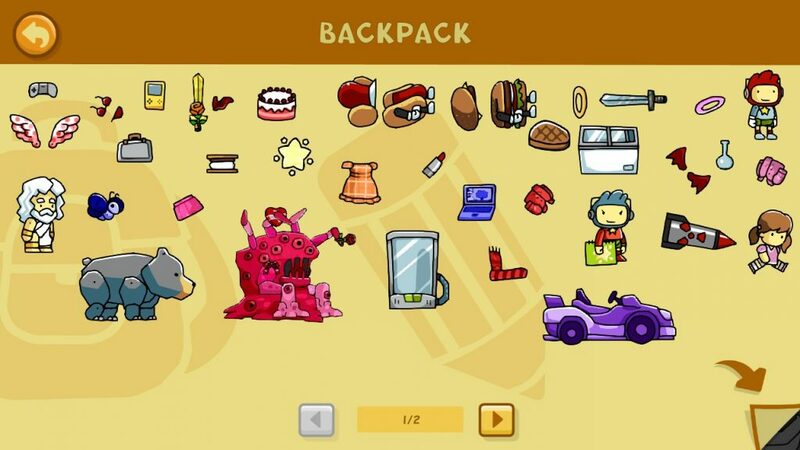 The backpack icon opens up your inventory. It is where you store objects you wish to reuse and edit in the future. When you create an item from the magic notepad, you can drag them into the backpack. Yes, it’s possible to stuff people and buildings in there too. Once you have items in your backpack. You’re free to drag them “under the fold” and place them in your surroundings. Drag items into the trash if you don’t want them anymore. The object editor is where you mix and match object parts just for the heck of it. Individual parts of premade characters or items can be modified either through texture repainting or reassembling them altogether. It is the glue and scissors icon. Remember to save your work before you leave! 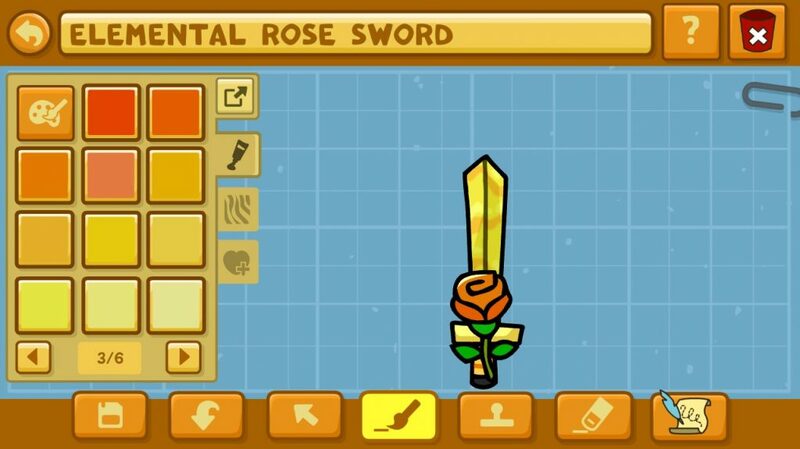 This Rose Sword needs light enchantment. A work in progress. The editor interface gives you the option to rotate objects, change their sizes, or send them into the background. The joystick tool has the notebook feature so you can retrieve any item in the game. If you prefer the preexisting joints or other physical features, you could drag and drop them on your creation. Are you more of an artist? The paintbrush tool has an array of colors and patterns to choose from. Best of all, they work on any individual parts of your creation. Mistakes are easy to fix as well. Just press the undo button or use the erase tool to remove undesired colors. The overview map is accessed by clicking the globe icon. 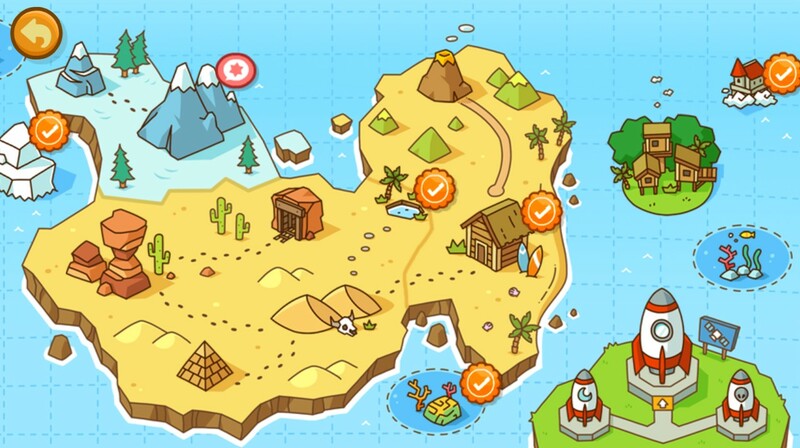 Shown below, it is an overhead view of the setting in which Scribblenauts takes place. Explore a wide variety of biomes, named after fonts or English grammar. New levels are unlocked once you collect a set number of Starites. Scroll across the map using your arrow keys and if you select a level, say “Ampersand Beach”, you’ll see how many Starites and shard pieces are in the level. The Starite icon is there to guide you on where to find both Starite shards and mini-game starting points. Like a 6th sense, it grays out everything else in the environment excluding the NPCs that give you quests, requiring you to help them solve a puzzling problem. Maxwell’s X-Ray vision is the definition of advanced. The total number of Starites and Starite shards in a level is shown here. Characters covered in orange initiate minigames while those in yellow offer puzzles in exchange for shards. Can you collect all 100? The Maxwell icon appears when you’ve strayed far from the avatar you control. Clicking it brings your focus back to your avatar. 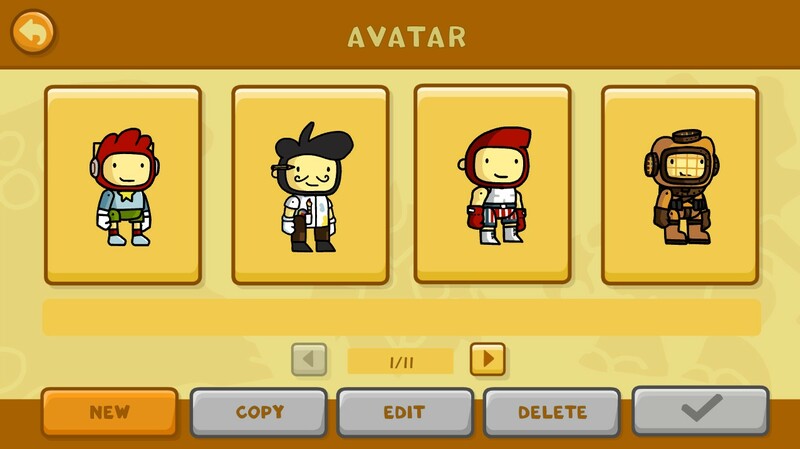 The default main character is Maxwell but once you unlock his cousins, you get access to the Avatar Browser which allows you to change your appearance to match theirs instead. They certainly have strange personalities. 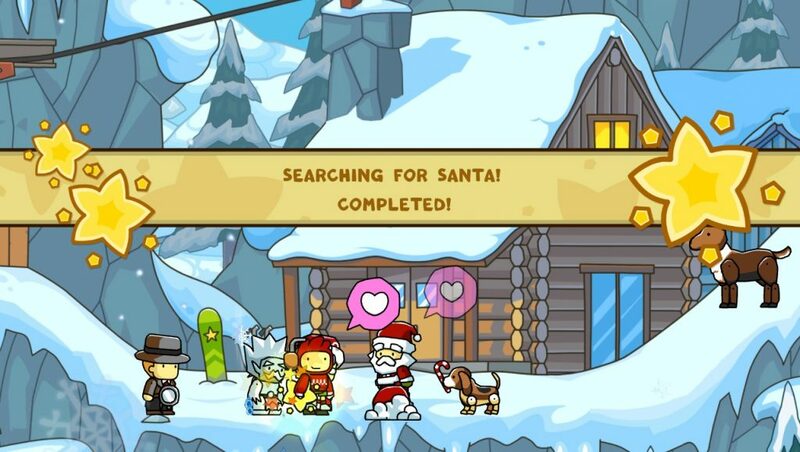 Scribblenauts Unlimited is all about unleashing your creative side and inventing your own objects at will. The solution is not always obvious on some puzzles, but there’s certainly more than one right answer. The game plays cheerful background music as Maxwell explores new areas for Starites to uncover. This sequel to Scribblenauts boasts a collection of colorful, quirky characters and places using bold outlines, just like a comic book. While the story takes a back seat, it’s still fun to summon objects and see how they interact with each other. 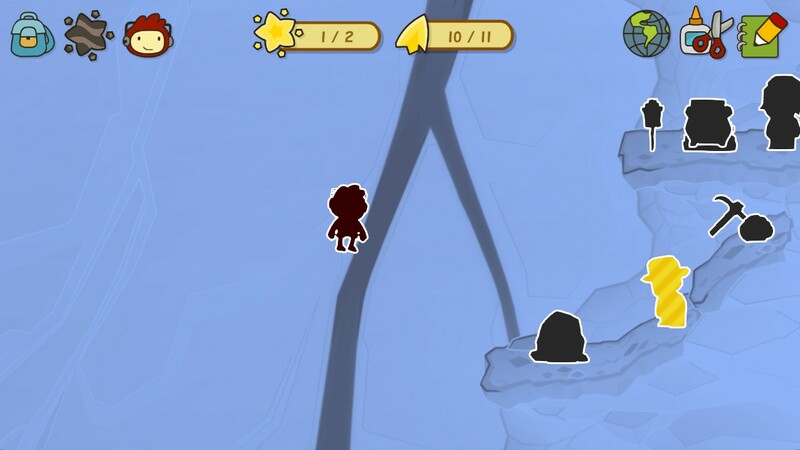 Scribblenauts Unlimited is a playground where you pretend to be God. As Maxwell, your magic notebook holds tremendous power over the world’s physics. It has sandbox properties, enabling you to summon deadly forces that could wipe out the whole level! The forces of nature are not to be tampered with. Weapons have their own default settings and firing range. Food can be eaten by NPCs or animals. Customize Maxwell by changing his size and texture. But the smartest move would be to strap a jetpack on and fly towards hard to reach places. I would like to caution you against doing so as terrorizing innocent denizens will prevent you from progressing through the game. Being too reckless by releasing a tsunami or nuclear missile does not work in your favor. There are many unique ways to solve puzzles, just try not to get Maxwell killed. Escape an evil scientist, battle alien invaders, help an island survive flooding, build the best cyborg fighter, simulate a battle between sea monsters, there’s a lot of awesome things to accomplish. Unleash your imagination now!